Sunday August 16th I had rectified the charts of 500 solo athletes, 250 of each gender. The 500 charts are used to test the AstroMate concept, and the test results are published continuously on this page. The AstroMate concept is a way of determining the astrological signature for a given group, in this case solo athletes, by use of Kündig rectification, harmonics and neural network technology. Harmonics are also known as Fourrier analysis or Fourrier transform in the mathematical world. Neural networks are explained here. August 19th: The randomized charts had been created, and all the charts had been set up to the AstroMate format (a manual process). January 19th: The project came at a halt due to lack of resources. In short I had to devote my time on making money on other activities in order to pay the rent and other expenses. With the present pace, this test is finished around February 1st 2016. I know the test is performed at a slow pace, but remember the hare and turtle competition! Being slow dosn't necessarily mean failure. Each 1% of the test represents 10 AstroMate runs, which take approximately 8 hours. Below is the actual test result. It is not final, it changes over time as more and more of the test is performed. With 44% of the test performed, lane 1 and 2 holds 79% of the scores. The distribution of the athletes' charts in the 6 swimming lanes expresses how precise the AstroMate concept is in determining a chart's affiliation with the athletes category. If AstroMate performs as expected, most of the scores from the athletes' charts will be in lane 1 and 2. This project with the 500 athletes has been criticized for being too broad. Astrologers like David Cochrane and Courtney Roberts have claimed on their web pages that it is better to do research on a more specialized group like e.g. tennis players or swimmers, because each sport demands different skills from the people engaged in it. I believe that is true, if the purpose of the research is analytical - i.e. to find astrological elements, which show statistical significance. An astrological element could for instance be a sun sign or a particular aspect between two planets. I believe such super-categories are much more useful and generic than a specialization within a profession or athletism. Furthermore, multiple intelligence theory is broadly accepted as "good science", and establishing a general link between astrology and multiple intelligence theory is the same as establishing a link between astrology and science. Such a link is being established - here and now! 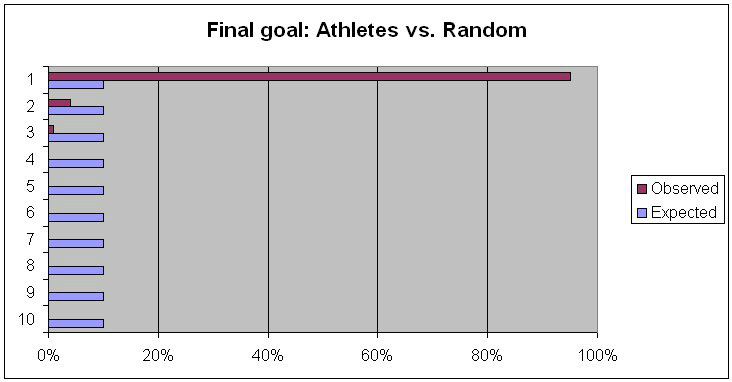 Even though I have only carried out 44% of the planned test, and even though only 79% of the athletes have placed themselves among the 25% highest athletic scores in the random data (= swimming lane 1 and 2) these results cannot be ignored, they can be repeated whenever wanted (for instance in a blind test), and they can still be improved, since I haven't taken all the methods of improving the the neural network's performance and capacity into use yet. The final goal of this project is: With 10 swimming lanes 95% ot the athletes scores shall be in lane 1 representing the 10% highest scores of the random charts. I will probably need more data than 500 athletes to reach this goal. This page was last updated February 15th 2016. All rights reserved for the content of the page.